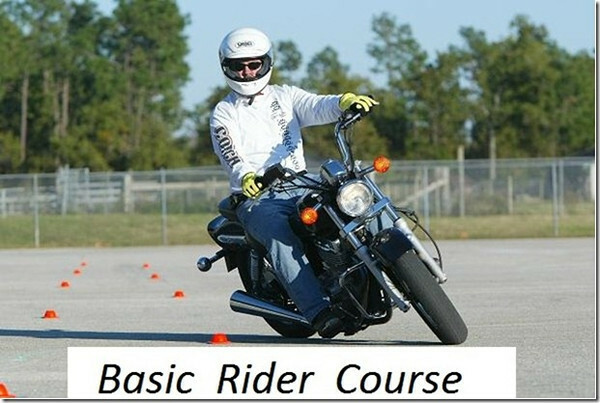 The Basic Rider Course is a building-block curriculum designed to introduce or reacquaint riders with the fundamental riding skills and traffic awareness to properly interact with other road users. Instruction consists of familiarization with motorcycle controls and operation, through the basic riding skills of straight line riding, shifting, turning, and braking. As the class proceeds, riders perform more advanced skills such as limited-space maneuvers, quick-stop drills, obstacle avoidance, and other exercises designed to build confidence and foster a positive mental attitude. Successful completion of the BRC along with minimum scores on the knowledge and skill evaluations will earn a waiver of ALL testing at the Drivers License office. THIS CLASS IS THE ONE THE STATE OF FLORIDA REQUIRES FOR ALL UNENDORSED RIDERS, regardless of previous experience. Part of the cost of the BRC is to provide you with a loaner motorcycle. If you have your own bike and it meets the following criteria set forth by MSF and the Florida Rider Training Program for training bike use, you may use it if you wish. If your motorcycle is LESS than 500cc's, AND has a wet weight of less than 400 lbs, AND a seat height of less 30 INCHES, AND you have current proof of Liability insurance on the motorcycle, it may be used in the Basic Rider Course. Copyright � 2009 DBinDB. All Rights Reserved.